Joe Flynn grew up with a clear sense of his primary role and duty in society. “I was always raised to think about where other people are coming from, and what struggles folks have, and that oftentimes the things that people have to struggle through are by no making of their own,” says Flynn, an associate professor in the NIU Department of Curriculum and Instruction. Flynn eventually realized there was a name for that philosophy instilled by his parents: social justice. And as a scholar and educator now committed to the development of social justice thinking in others – pre-service teachers, working teaches and school leaders chief among them – he cares deeply about the topic. 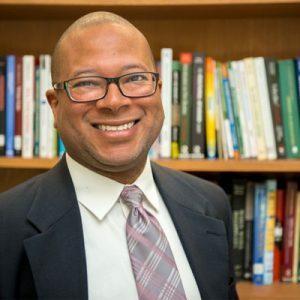 The associate director for Academic Affairs at NIU’s Center for Black Studies has proven as much the last two summers with colleague James Cohen as the organizers and “counselors” at the Social Justice Summer Camp, which is gearing up for Year Three this June. 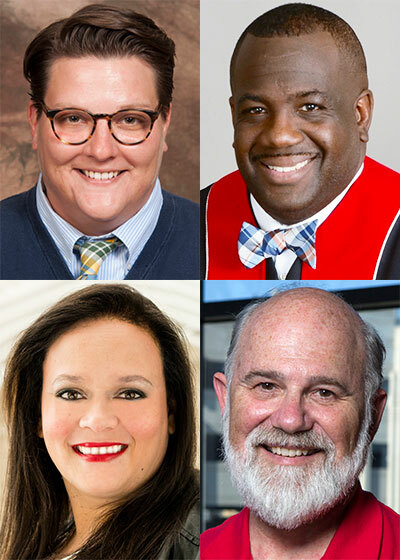 The NIU College of Education’s upcoming Community Learning Series on “Social Justice: What it is. What it isn’t.” will shed light on questions of equality, equity and fairness at a critical time in America. Top: Katy Jaekel and the Rev. G. Joseph Mitchell. “Social justice is a really broad concept with a number of different umbrellas – transgender relations, economic status, physical abilities, sexual identities,” says Flynn, who will moderate the panel discussion. Scheduled for 6 p.m. Thursday, April 11, the event takes place at the Barsema Alumni and Visitors Center, 231 N. Annie Glidden Road. A reception with light refreshments begins at 5:30 p.m. 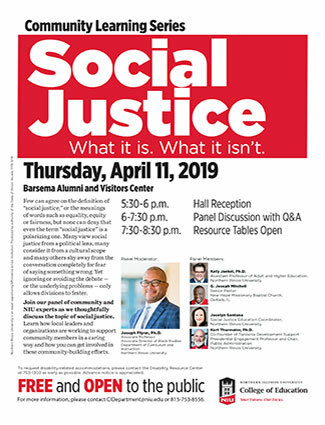 Representatives of various local social justice organizations will staff resource tables from 7:30 to 8:30 p.m. to share information and answer questions. Kurt Thurmaier, co-founder of Tanzania Development Support, Presidential Engagement Professor at NIU and chair of the NIU Department of Public Administration. Flynn expects thoughtful dialogue from the diverse and knowledgeable panelists, each of whom will make an opening statement before taking questions from the moderator and the audience. His hope for members of the audience is that they will not only “explore their own understanding of what social justice is or isn’t” but also to “explore their own challenges” in thinking about or living in a socially just way. By the end of the evening, Flynn adds, people might find the motivation to regard the world as he does. For more information, call (815) 753-8556 or email CIDepartment@niu.edu.